Want to cut deep into how forensics really work in the crime field? 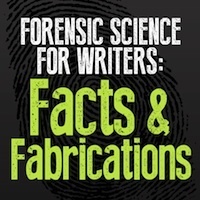 Then join Jennifer Dornbush, author of Forensic Speak at the Writers Store, October 12th, 2013 for her special 90minute crash course Forensic Science for Writers: Facts & Fabrications! Have you ever wondered if coroners really eat sandwiches while doing autopsies? Or if wearing a low cut dress and high heels to the scene of a crime is sanitary? Writers, directors, producers--- find out the answers to all these and more as we delve into a 90 minute crash course on reel versus real forensics. Walk away knowing when to fabricate and when to authenticate your crime fiction. During this interactive seminar we'll explore 10 common forensic misconceptions portrayed on TV and film and why writers need them! Jennifer will unravel the top 10 forensic follies you can turn into writing tricks! We'll view clips that illustrate fabrication techniques she has coined as "The Tick Tock", "Trigger Happy", and "The Gloss & Go". Jennifer explain the real life forensic facts behind every on-screen fabrication and couple this with Writer's Notes that convey why these forensic shortcuts are necessary. To top it all off, she'll share 10 exciting tips from currently working TV writers (CSI, Hawaii 5-0, Suits, White Collar) on how to fudge the forensics while still making your story believable and entertaining.